Hospital Records proudly present the next chapter in their massive compilation series, 'Sick Music 2019'. 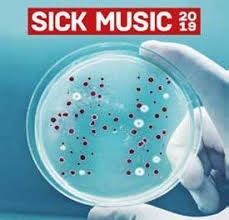 It's packed with 25 brand new and exclusive tracks from Hospital and Med School surgeons alongside some very special guest features, all carefully selected as the future drum & bass anthems of 2019. This diverse selection of 174 beats comes from the likes of London Elektricity, Fred V, S.P.Y, Metrik, Grafix, Logistics, Whiney, Unglued, Benny L, Flava D, Bou, Pete Cannon, Gridlok and many more. After the announcement of the dynamic duo's decision to focus on individual projects, Fred V and Grafix present their first solo releases in almost a decade. Renowned for synth-driven symphonies and soothing songwriting, Fred V brings a high dose of octane electronica in the down tempo fix, 'Burning Me'. studio a the dynamic funk-ladened D+B spectacular, 'Funkopolis'. Other highlights include Benny L's re-rub of John Holt's reggae hit 'Police In Helicopter', with a rugged bass to make the rave shake. The first lady of Bassline and UKG royalty Flava D also joins the fold for an exclusive first flex into the realms of D+B, the silky slick selection 'Return 2 Me'.